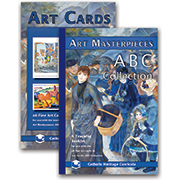 Art Masterpieces: ABC Collection consists of 26 full-color Art Cards and an accompanying Teaching Booklet with detailed picture studies. Featuring the work of artists such as Renoir, Murillo, and Van Gogh, the paintings have been chosen with the goal of instilling in a child an interest in beauty, composition, color, and line. The glossy, high quality art cards are printed on thick cardstock and are sized for small hands to study and manipulate. To complement the other topics a child is learning at this age, the art cards and picture studies reinforce the alphabet, colors, shapes, and numbers. Ages 4-6. 26 Art Cards: Cardstock, full color, 5 1/2" x 8 1/2"
Teaching Booklet: Softcover, black and white, 58 pgs. 5 1/2" x 8 1/2"